As a documentary filmmaker, traveling for work is often the most authentic way to experience a place, if not the most pleasurable. Sometimes, as filmmakers we may be seeking beauty, but often we’re looking for something else that expresses the strange, unexpected struggles that underly our survival on this planet. This last year I traveled across the continent, from New York to Alaska, on a series of trips, as the American producer on an Austrian film about a Russian woman in New York, trying to walk home, heading for the Bering Strait. * The film is an unusual hybrid of unscripted fiction and documentary, and was inspired by a true story from the 1920s. Our version is contemporary and takes much poetic license. Along with being a story about a lone woman on an epic, existential journey, it is also a story that slices through North America at this particular juncture in time. We were not making an “environmental” film per se, but we were working in some extraordinary places that also happen to be environmental flashpoints. One of the most striking places we filmed at was the encampment at the Standing Rock Sioux Reservation in North Dakota, where Native Americans and their allies are resisting the Dakota Access Pipeline, slated to carry oil across the Missouri River just north of the reservation.The river is the main source of drinking water for the reservation and millions more downstream. It had been deemed too risky for the pipeline to cross the river at the state capital, Bismarck, 40 miles north, where the population is largely white. The encampment had established a site where ceremony, music and organizing were taking place all day and into the night, along with an ad hoc infrastructure to care for and feed hundreds – soon to be thousands – of people every day. We were at Standing Rock in August, just as it was becoming a big international story. Among other things, we filmed statements by tribal leaders as they arrived in a steady stream of support, bringing together the largest number of tribes ever. For Native American cultures, respect for the natural environment is a guiding principle, and that was a powerful message to hear over and over again. I became acutely aware of how Standing Rock was tying together the crucial issues of our times – racial injustice, climate change, and the influence of corporate interests on our politics and economy. Native American reservations are some of the poorest communities in the United States. Pine Ridge Reservation in South Dakota, which encompasses parts of the Badlands, where we also filmed, has a per capita income under $4,000 per year, and 60 percent of the people do not have electricity and running water. Life expectancy is the second lowest in the Western hemisphere, after Haiti. While these statistics are bleak, the gathering at Standing Rock has energized an indigenous environmental justice movement that is gaining global support, although they clearly have a big hurdle ahead with the Trump administration determined to go forward with the pipeline. Later, in Canada, we went to Fort MacMurray in Northern Alberta, to film at the tar sands, or oil sands, as they are referred to locally. Last year, Fort MacMurray was engulfed in a devastating wildfire that was fueled by a hotter, drier climate. The fires spread dangerously close to the oil sands operations and shut everything down. As we approached Fort MacMurray we drove through miles of burnt trees that stretched as far as the eye could see. The oil sands region in Alberta has one of the largest oil deposits in the world. It is also one of the dirtiest energy sites anywhere. The extraction of oil from the thick mixture of bitumen-covered sand requires enormous inputs of natural gas and chemicals. The controversial Keystone XL Pipeline was built to carry the synthetic crude that is produced in the oil sands, and while the pipeline was halted by an opposition movement, it is now also getting revived under the Trump administration. The area is one of the most dystopian places I have ever seen. 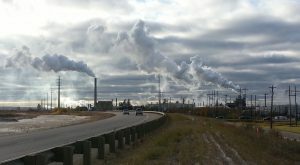 Driving north of Fort MacMurray toward the mining operations, we were hit by a pungent, acrid smell among massive installations that produce a level of emissions so high they can create their own weather system. We experienced a strange artificial snowfall there. We ended the production in Anchorage, Alaska, where we intended to film wintery scenes. It was November, when snow and ice can be expected. But snowfall has diminished considerably in recent years. With climate change, Alaska and the Arctic are warming at a faster rate than other parts of the world. The first few days we were there it was warm and sunny. The sunshine turned to drenching rains, and we filmed our character walking through heavy, foggy rainfall, which could have been almost anywhere. This last year was an interesting time to be crossing the country, particularly as the only American among a European film crew, partly seeing it through their eyes. The election was on everyone’s mind and we had many conversations with people along the way, whose politics we disagreed with, but with whom I sometimes found a surprising amount of common ground. Chances are I wouldn’t have had these kinds of encounters if I the work hadn’t taken me to places I might otherwise never had visited – such as former coal towns in Pennsylvania, or the prairies of rural Nebraska. In any case, I was reminded of how big the country is, and how little we talk to each other outside of our like-minded bubbles. The project still has a long editing process ahead with almost 200 hours of material. It’s an enigmatic story; no one knows for sure if the original character made it back to Russia in the 1920s. In the film, too, there are more questions than answers. Stay tuned. * The film, Lillian, is directed by Andreas Horvath, and will be completed sometime in 2018. The themes exposed in this acclaimed documentary perfectly blend with those of the MSoE: “Ancient oceans teeming with life, Norwegian settlers, Native Americans and multinational oil corporations find intimacy in deep time. Following up his 2009 feature Crude Independence (SXSW), Deep Time is director Noah Hutton’s ethereal portrait of the landowners, state officials, and oil workers at the center of the most prolific oil boom on the planet for the past six years. 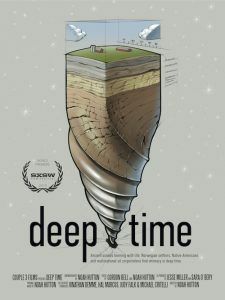 With a new focus on the relationship of the indigenous peoples of North Dakota to their surging fossil wealth, Deep Time casts the ongoing boom in the context of paleo-cycles, climate change, and the dark ecology of the future” (adapted from the film’s web site). 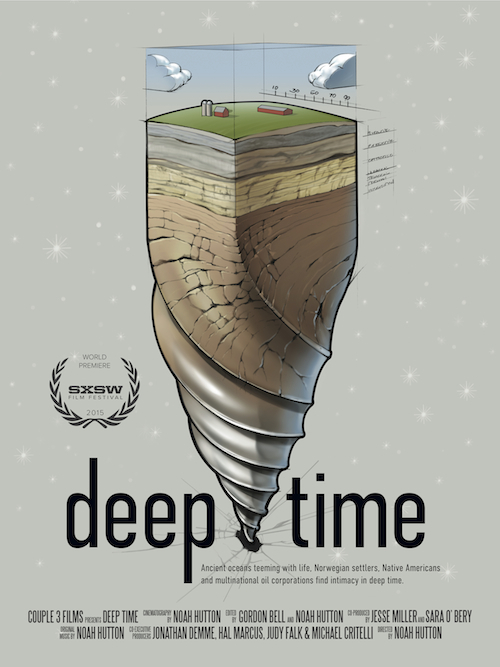 Deep Time has been well received by critics and audiences alike. It won the Special Jury Award at the 2015 Environmental Film Festival at Yale, as well as the Jury Award for Documentary Features at the 2016 Wild and Scenic Film Festival. We’re excited to have Noah Hutton join us for the screening, which will be followed by an open Q&A with the audience to explore both the subject of the film and the craft of film production. The screening will be held on July 19th, 7:30 pm in Dana Auditorium on the Middlebury College campus. The film is free and open to the public, and we hope you will be able to join us.